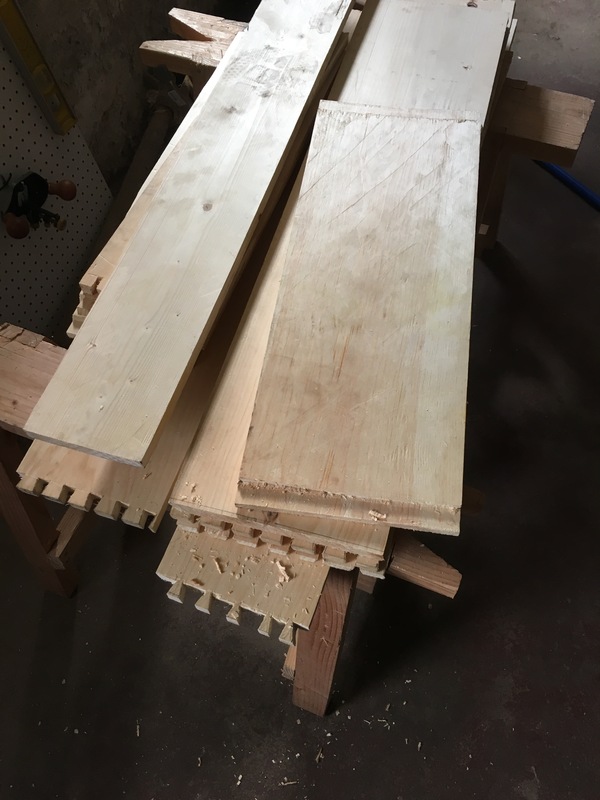 I went into the woodshop the other day to find that the boards on which I’d lavished so much attention cutting dovetails, had light showing through where they’d been glued. Either the change in weather summer to autumn, or the change in humidity, or the failure to move this project along at a fair clip, or something like that (maybe my failure to use biscuits or pegs?) has split several boards along the glue lines. A few quick tests revealed that all of the boards’ glue seams were problematic. Either the boards were warping or the glue hadn’t properly dried or the glue had taken on extra moisture or … I don’t know. Lots of potential difficulties here. So, I disassembled the boards. Later I’ll cut off the dovetails and pins, sand the edges smooth and try again.